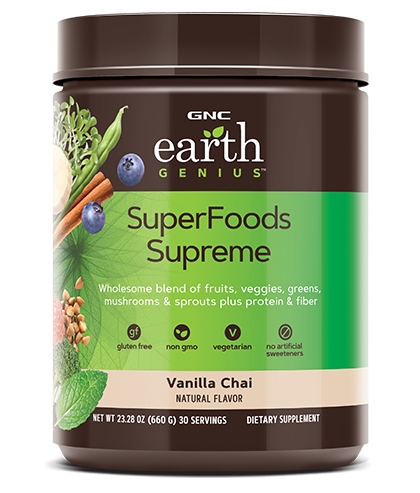 Take back your nutrition with GNC Earth Genius™ SuperFoods Supreme. Get more of the key nutrients your body needs to add balance to your diet with this daily superfood powder. Contains Tree Nuts (Coconut) and Wheat (Wheat Grass)^. Add one scoop to 6 to 10 fl. oz. 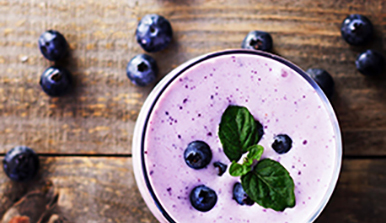 of cold water and mix thoroughly or supplement a smoothie with an extra scoop. Use daily for best results. Keep out of reach of children. Store in a cool, dry place. no more average joe. 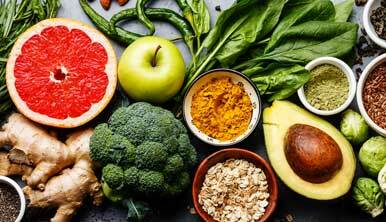 load up on nutrients with SuperFoods Supreme. what makes it genuis? There are over 35 different superfood ingredients, plus protein, prebiotic and enzyme support in each scoop of SuperFoods Supreme. On my second jar, it all sounds, and reads well, but have yet to notice anything it says it does!!! BEST ANSWER: This product contains plant-based protein that includes Organic Pea Protein, Organic Rice Protein, Organic Hemp Protein, Carob Protein & Algae Protein. Can it be a meal replacement? Nate is correct. This product is not considered as a meal replacement. This is used to add balance to your diet. Have a gallbladder issue will this help? BEST ANSWER: Hello! We would recommend speaking with your doctor about this. Do you mix this with water? BEST ANSWER: Yes you can mix it with water. Try to find what water to powder ratio works for you so that you get the best taste out of it. I also do milk sometimes with fruits and nuts to give it an extra kick. I mixed it with water and I also tried it with milk. Does the Vanilla Chai taste good? BEST ANSWER: I think it tastes great! Brought it back. It's not organic. I won't use anything that is not organic. I love the taste!! It is an enjoyable part of my daily routine to help improve my nutrient intake. The taste of the Supreme Foods is good. 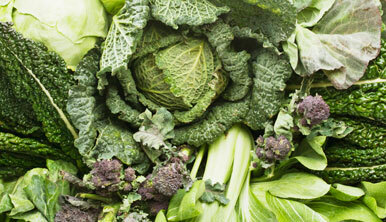 How many servings of fruit and vegetables are in a scoop of the superfood supreme?